Continuous, Rotary Type Through-flow Dryer | Product Information | KURIMOTO, LTD. This dryer has double rotary shells consisting of a horizontal external shell and an inclined internal shell. The internal shell is comprised of numbers of vanes as shown in the figure. The annular section between the external and internal shells serves as a passage of the hot air and is divided into numbers of segments. 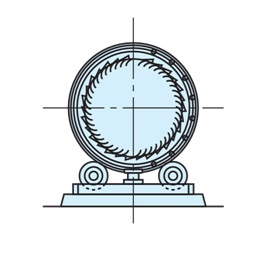 The hot air is fed from this annular section through the gaps between the vanes and exhausted through the material layer, which continuously moves. The material is fed into the internal shell from the same direction as that at the hot air inlet and dried along with the shell rotation while continuously moving to the outlet. The hot air passes directly through the material layer to provide a maximum of touch area between the hot air and the material, allowing a large calorific value, Ua = 2,100 to 7,500 KJ/m3hr℃, which transfers from the hot air to the material. It is possible to provide 15 to 20% of hold-up compared to 10% with other types of rotary dryers, making it possible to reduce the volume of the dryer. This dryer has no process to lift the materials up and down with a lifting wing, suppressing the destruction of the material particles. This dryer has no process to lift the materials up and down with a lifting wing, minimizing the wear of the vanes. Superb mixing of materials is provided through the rotation and aeration, enabling you to get homogeneous products with uneven drying minimized. Possible extended residence time (some for 3 hours) enables the materials to be dried up to extremely low moisture content. A constant rate of hot air can be fed in the material layer. Drying and cooling can be performed in a single unit.